Thinking of getting a car respray? Auto Medics are here with the things you need to consider before in your respray. Unless you are a car pro with the know-how, a good space to work, the correct equipment and safety equipment then you should leave your paint job to the professionals, not only do we know how to deliver the perfect finish fast and effectively but we are also aware of the health and safety and environmental implications involved with the process and how to deal with them. It is vital to do your homework before enlisting someone to respray your motor. Avoid hiring the cheapest, nearest, easiest option. You need to locate someone with expertise and precision. Obtain a range of quotes, take a look at their premises and ask for references or check out motors they have resprayed. For the best finish possible a respray needs to be done on a surface that is as smooth and flat as possible. This means having dents, scratches and scrapes removed before respraying your vehicle. There’s skill involved in prepping a car before work commences. It’s important to get the prep right or it can be costly to fix. 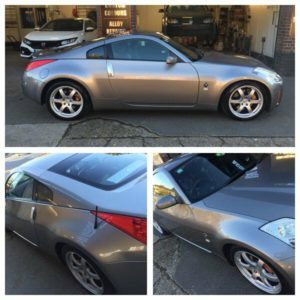 Experts will take off removable elements that don’t require painting, and mask windows, lights, trim, alloy wheels and so on with due care and diligence. Ensuring the correct paint colour is chosen. Rubbing down before applying a top coat and lacquering. Rubbing down before buffing and polishing. The time and skill that go into these steps have been acquired by professionals and built up through vigorous training and years of practice. We take pride in ensuring every customer is satisfied with the end result, for more information about car resprays get in touch with the professional team at Auto Medics on 01494 533 534.